A disused attraction which once catered for thousands of visitors to Blackpool is to re-open to provide jobs for the homeless. A once-vibrant crazy golf course could bring joy to children once more as volunteers vow to return it to its former glory - all to help Blackpool’s homeless community as they struggle to find their way into work. 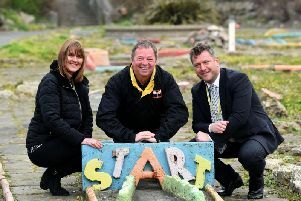 Pictured from BFL are therapeutic activities cordinator Amanda McVittie with partnerships manager Ian Treasure with CEO of Blackpool and Fylde Street Angels Paul Rawson (centre). 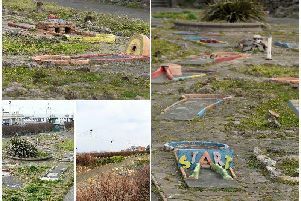 The old crazy golf course near the Metropole Hotel on Blackpool Promenade has stood in a state of disrepair for years. Once a popular attraction for tourists in the 1960s, who gathered in sunhats and foral summer frocks to try their hand on the series of 18 different holes, each decorated with obstacles preventing a hole-in-one, the course was closed in the 1980s and since then has been worn down by time and the bitter winds off the Irish Sea. Now an ambitious group of volunteers from Blackpool Fulfilling Lives and the Blackpool and Fylde Street Angels hope to breathe new life into the dilapidated golf course with a full makeover surrounded by vibrant plants. Once completed, the attraction will be used as a stepping stone for Blackpool’s homeless community to make their way back into full-time work and housing. Ian Treasure, partnerships manager for Blackpool Fulfilling Lives, said: “Last year we met with disadvantaged people from Blackpool to ask what it was that we could do to help. Two main things were that ‘people wouldn’t give them a chance’ and ‘they were bored’ so we started a litter picking scheme in partnership with Street Angels who also work with Blackpool’s homeless community. This began to give disadvantaged people a sense of purpose. “Our whole programme is about helping people who are disadvantaged - they are homeless, suffer from drug and alcohol use, and that leads to other mental health problems. “When we said what is it we can do, they said they had nothing to do because nobody would give them a chance. They couldn’t get jobs, so we said we’d come up with some ideas. “Throughout the summer months we worked with the Street Angels and we picked up litter, and we came across the golf course just on the other side of the Metropole Hotel. “It took us a few months to find out who actually owned the land, and it turned out it was Blackpool Council who owned it. “We spoke to Blackpool Council planning, who have been supportive, and they asked to see what we have got. “The whole idea of it is to renovate the golf course and then open it as a social enterprise, which means all the profits will go back to the charity, that will go into helping the homeless population of Blackpool. “We want to offer people who are unemployed and possibly homeless work. The plan was announced by Blackpool Fulfilling Lives online this month, and within 24 hours the group had received more than 50 offers of help from local tradespeople, including builders, joiners, gardeners and electricians. The organisers plan to restore as many of the original holes on the crazy golf course as possible, and add Blackpool-themed holes to any in disrepair. There are also plans to sell tea, coffee and snacks to golfers at the course. It is hoped the course will be repaired in time for its first volunteers to move in before this year’s peak season during the summer. Ian said: “There is a real desire locally to see this course open again. It’s a part of Blackpool’s history and it can secure a future for the most disadvantaged people in Blackpool by giving them a chance and a sense of purpose. “We believe this will help remove the stigma that some of them feel, and help them believe in themselves again. Paul Rawson, who co-ordinates the work of Street Angels, added: “We would like to get people who wanted to volunteer involved from the very beginning. It needs so much work doing to it in the first place. “Once it’s all up and running the money will come back into the project to support people caught up in rough sleeping and other things that go with homelessness. “For those who want to get work experience and feel valued, it’s a way of getting out of just loitering around the streets. “In the first place it will be for work experience, but the hope is that eventually it will generate enough income that we will also see people have opportunities for employment. “We support people with multiple complex needs being caught up in that circle of frustration, whether its rough sleeping, relationships breaking down, people find they can’t function or support themselves. “Obviously they can’t have everything handed to them on a plate, they need to want to make a difference, and this project is going to be for people who do want that. “It’s not going to be for people who are going to loiter or take drugs. “What we want is for people to engage with ourselves. “We go out and speak to people in the town centre and there are those who do want to change their life circumstances. “Just by giving a couple of hours of their time working to help with the maintenance of the golf course, that can lead to them getting a placement, whether that’s work experience or leading into full-time work. A Blackpool Council spokesman said: “We are always exploring ways and means of bringing assets back into a positive and productive use and welcome interest in delivering these outcomes. Blackpool Fulfilling Lives and Blackpool and Fylde Street Angels are two charities helping homeless people in the resort. Fulfilling Lives is paid for by the Big Lottery fund and works with Lancashire Police, Blackpool Council,the NHS and the probation service to help people who are living chaotic lives. The Blackpool and Fylde Street Angels provide hot food to homeless people on Blackpool streets every Monday night, basic first aid on weekends, and shelter for adults during severe weather periods. Paul said: “There are a number of charities in Blackpool that are available for the homeless population and it’s often getting people into these places in the first place that is difficult. “You can feed people and clothe people and give them a sleeping bad bit the problem is that we are keeping people in that environment. “Through this we are doing something that changes that environment and gives them that chance. Anyone who wants to help with the renovation of the crzy golf course behind the Metropole Hotel on north Promenade should contact Blackpool Fulfilling Lives on their Fabeook page, or the Street Angels on by emailing help@bfstreetangels.org. 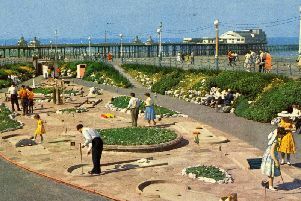 The Blackpool Civic Trust has expressed interest in the plan to rejuvenate the crazy golf course after being approached by Blackpool Fulfilling Lives. Paul Humble, project officer for the Blackpool Civic Trust , said: “We are very interested at the Civic Trust because we think it’s a really worthy project and we also think it’s an eyesore that badly needs cleaning up,” he said. “I think this proposal is a very imaginative one. “ I think it will give the homeless people of Blackpool a real sense of purpose and I think it’s important that that part of Blackpool be tidied up. “With the new tram extension people will be getting off at Talbot Square, and they have got the North Pier which is magnificent, the Metropole Hotel which is an impressive building in its own right, and all the listed shelters on Blackpool Prom, so we want the crazy golf course to be brought back to life again and draw people in as it once did.